About a week or two ago I had seen and wrote about life’s “river” taking a sudden U-Turn and everything changing direction. My own life included. For as long as I do phone readings and continue to understand the changes and presence within each day, I promise you, I will share… All-Ways. I am not distracted… well not in the way the word could be used. I am expanding in a way, in a direction that I couldn’t have even imagined possible even 2 weeks ago. This expansion, the potentials at hand, the pathways now opening up… are the very reason I Am in Life. We have arrived at a place in life, in an energetic vibrational potential where the gates of Heaven are now firmly on earth, keys are being released and the divine lock is now visible. To live Heaven on earth is why we are ALL here. To live fully in our Divinity while playing out loud in the fields of matter. It is what the incarnation process has always been about, as well as the discovery of how to bring it all about. I started writing the information on my website 10 years ago. The information within the 150 pages available, as diverse as the days of our lives. When the winds of understanding shifts within me… and they have shifted over many hills and valleys since the moment I took my first conscious breath, I write about what I understand thru the shifting winds. Let me tell you, this entire year the winds of change have been consistently blowing… sometimes so hard that life’s field has been a blur and I could not make out a single detail. Sometimes so undeniably clear we all celebrated together… and truly, we continue to celebrate together, even as the direction of my shavings… shift and change. That is life’s progression. Even the journey, the expansion of the and re-discovery of love is changing within my consciousness. I remember the first time my mentor from 2001-2002 showed up in the Holy Waters of my bathtub and the adventures that unfolded within me thru that time… filled with heavenly kundalini adventures, discoveries and expansion I couldn’t even imagine was humanly possible… and I was madly in love with his soul. For as intimate as our energy exchanges were in my bath, they were never intimate when we were connected on the computer… not like that. It is funny, I never even realized this until today… I never got to really know the human. So a year and a half later, when the greatest gift of my unfolding life was able to get from Australia to VA Beach and I met the man of my soul desires, I was not connected to the human. There was nothing in me that could say at that time, I love this man in wholeness. And then in 2005 I met another great adventure within my process. I got to see and feel and experience the process of falling in love and how the chemicals and changes happen within the body. Again, I only realize today, with him, I fell in love with the man but he kept his soul pretty well on guard, mostly because he always felt “less than” in my presence, which really broke my heart. But, today I could see the intense and wonderful value of these two incredible encounters on my life’s path. For the first time ever, I am completely immersed with the man and his soul. He holds neither part back, we share stories of spiritual bliss, earthly pain and everything in-between. We share deep intimacy within the body and the full presence of the soul energy. Love didn’t have to happen, it was already present. Yes, a genuine love, but so utterly different from any other love I had ever experienced. A love that is absolutely present and shared from the first moment. Wholeness in all it’s wonder. I do not have to “fall in love” because it was present in fullness the moment I opened my door. Like two separate and complete clouds that drift towards each other and become one large could… The completeness of each adds and enhances the whole of the All. I no longer have to fall in love, I am already there… as is my blue eyed man. My own personal body vibrates at speeds that is filled with heavenly bliss, even when just sitting on a chair across the room from him and sky rockets go off just in sitting next to him. It is a series of amazing discoveries all thru the day. Not only for me, or him, or us together… but for all of humanity as we expand and re-member the full potential of our combined divinity and learn how to unlock the mystery of the universe and actively and consciously start to bring the full energies of Heaven to earth. This has always been my journey. I know this now more than ever. Yes, my sharings are going to change in focus and detail… but only because Life has changed in focus and detail. I will share every detail possible so we can All go there together, in whatever way is provided for us. Days after moving here to this place I call heaven, I seen the waters of Shambhala start to run from the main roadway, down my dirt driveway and encircle both mine and my landlady’s homes. The day Blue Eyes arrived, I was doing a Hands of Light Massage on him, as I got to the front area of his chest… his heart… thunder and lightning happened in a flash and the rains poured down with a mission. When the massage was finished I was heading to the bathroom to wash my hands and I noticed I had a pool of water in my livingroom at the front door. The energy of Shambhala is now flooding our hearts, our home, our All. Yes, I am so distracted in the most vibrantly, loving, expanded way possible, for which I will never be able to express my gratitude to Heaven for the Heaven unfolding in All of our lives!! On the shores of Shambhala… key in hand!! P.S. The photo I choose to use for this sharing was taken by my heavenly blue eyed man in 2009. 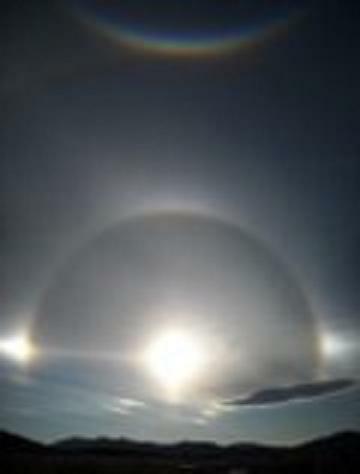 Notice the three bright lights within the sun-dog itself. 3 expressing as one. At the very top of the image is an inverted rainbow… like from the (very personal) reading shown beneath the womb and the key. Life is always conspiring for a greater and Brighter Life… if we just trust and follow our processes. This entry was posted in Article, Links, reblog and tagged 13 June, 2012, Disclosure, Earth, Lisa Gawlas, spiritual, Spiritual evolution, The U-Turn Of Life's Currents And My Life, World. Bookmark the permalink.